The Hathaway Primo Soccer table is a premium grade table game designed for family foosball fun with the highest quality materials. Smaller than a full-size foosball table, its overall dimensions are 60 inches long x 40 inches tall and table top 12 inches thick allows this family friends entertainment option to fit into most family rooms without taking over. The green colored melamine playing surface sports authentic “soccer field” graphics. End zones and scoring tabs feature attractive chrome accents. Adjustable feet at the bottom of the table legs allow for some height adjustment while ensuring a level foosball playing surface. Dark CARB certified side panels made out of MDF with black legs and chrome colored accents on the corners, it is an attractive table meant to be the focus of a family game room or even as a fun office perk. Sturdy cross braced construction ensures during active play there is minimal table movement, negatively affecting the competition. Legs are constructed out of solid wood, providing a sturdy foundation for hours of action. 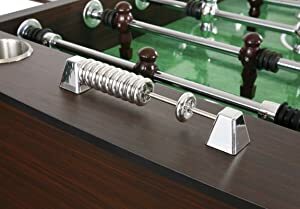 Overall, when seeking a new addition to the weekend entertainment arsenal, this foosball table has all the details and solid construction needed for years os use to come. The Hathaway Primo is an attractive, solid foosball table with all the bells and whistles you would expect in a flat-pack piece. Chrome accents on the knobs and playing surface look attractive and withstand considerable abuse. Adjustable feet on the table legs allow the owner to ensure a true flat surface for accurate play. Added cross support beneath the playing field ensures that the top will remain flat and level over time and not warp. Dark MDF paneling will blend in nicely furnished family room or office environment. It doesn’t look like it belongs in an arcade or child’s room. The players and knobs are all well crafted and nicely balanced, providing quick, precise play. Their customer service department is friendly and willing to assist with any problems on new tables. It takes a considerable amount of time to assemble this easy-to-assemble table, It may take over three hours to follow all the directions, while the package says it should only take two. Side panels and underpinning wood components are weaker than they would be in a more expensive unit. Under the intense use of an active family, it can be expected the MDF panels will crack and screws will back out of the thin wood blocks underneath. Unit only comes with two balls–buy extra. The corners which appear as chrome in pictures are actually plastic and subject to breakage. 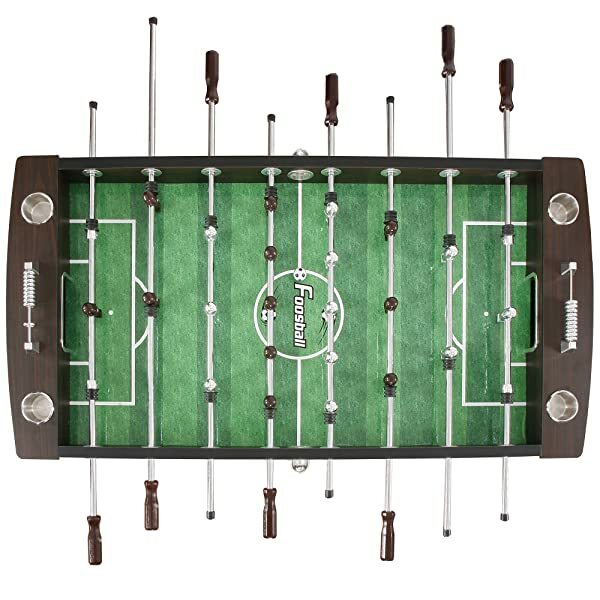 General use by foosball game enthusiasts, college dorms, family rooms, casual offices are probably what this table is best for. Families with tweens, high school and college students will get much use out of the unit. 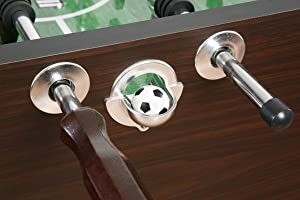 So, if you need a cheap family foosball table for teens, then this one is a great choice because it is affordable and it looks great in the home. If you are practicing hours a day for your local foosball tournament, this table may disappoint. While it has an attractive exterior appearance, the hidden construction is not intended to stand up to extended, physical play that intense users might use. The Hathaway Primo Soccer Table is a solid investment for the family game room. Well-crafted with attention to the details that affect play action the most, it will serve its owner for years to come. Attractive and reasonably easy-to-assemble, it will blend in nicely in an office, living room or gaming room without looking cheap or out of place. Counter-balanced players and stainless-steel spin rods give the player a consistent, precise feel to the action. Overall, a solid buy for home entertainment without breaking the bank.